High Halden airfield, July 1945. The ALG's laid down in southern England had two runways, while the ones laid down in France after the invasion generally had only one strip laid down east-west for speed of construction. RAF High Halden is a former Royal Air Force Advanced Landing Ground in Kent, England. 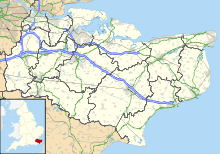 The airfield is located approximately 8 miles (13 km) west-southwest of Ashford; about 50 miles (80 km) southeast of London. Opened in 1944, Ashford was a prototype for the type of temporary Advanced Landing Ground type airfield which would be built in France after D-Day, when the need for advanced landing fields would become urgent as the Allied forces moved east across France and Germany. It was used by the United States Army Air Forces. It was closed in September 1944. Today the airfield is a mixture of agricultural fields with no recognisable remains. High Halden was known as USAAF Station AAF-411 for security reasons by the USAAF during the war, and by which it was referred to instead of location. It's USAAF Station Code was "HH". The group was assigned to the XIX Tactical Air Command, 100th Fighter Wing. The 358th began movement to the ALG at Cretteville France (ALG A-14) on 29 June, however the group continued to operate from High Halden until 16 July with the remainder of the ground support personnel leaving on the 18th. With the facility released from military control the airfield area was returned to the farmers, which put it back into agricultural use. Today, the area is unrecognizable as an airfield. High Halden's precise location can only be determined by matching the secondary roads in the area with those visible on aerial photography taken during the airfields active use. Close examination of recent aerial photography shows some evidence of scarring on the landscape that still exists, which align with the NE/SW runway. In the local area, a few outward traces remain of the airfield, consisting of some metal PSP that was used for fencing. A memorial to those who served at the airfield has been erected close to the northern end of the 04/22 runway on Bethersden Road. Wikimedia Commons has media related to RAF High Halden.